The Hague (the official Dutch name is 's-Gravenhage, the city is also known as Den Haag). The city is one of the largest in the Netherlands (3rd largest, after Amsterdam and Rotterdam). The city has a population of about 500,000 and is located in Zuid Holland (South Holland). The Dutch government seats in The Hague, but it is not the capital of the Netherlands, that is the city of Amsterdam. The Queen also lives and works in The Hague. 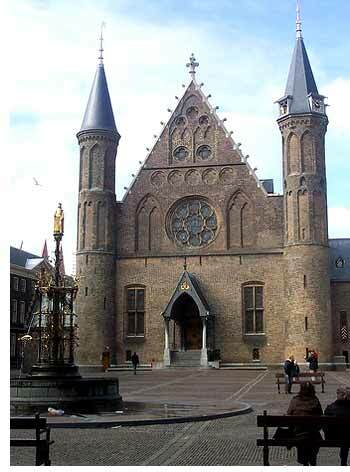 The city was founded in 1248 by Willem II. He built a castle in a forest near the sea in Holland, where he intended to live, but he died in a battle before he could be crowned. The castle was never finished, but parts of it remain and are now called the Ridderzaal (the Knights' Hall).